Slinking into the outdoor hot tub, thick globules of snow oozing over the tan-coloured chalet roofs, I feel properly ensconced in alpine life. Everything about the pretty chocolate box town of Gstaad seems to perfectly encapsulate its “come up, slow down” ethos. Firstly you’re arrival into town is along one of the oldest and most beautiful train routes in Europe. The Montreux Oberland Bernois railway carves through alpine valleys and winds skywards into the mountains, its elegant carriages chuffing higher and higher past snow-swept scars, emerald glacial streams and tiny hamlets until real life feels a long way away. 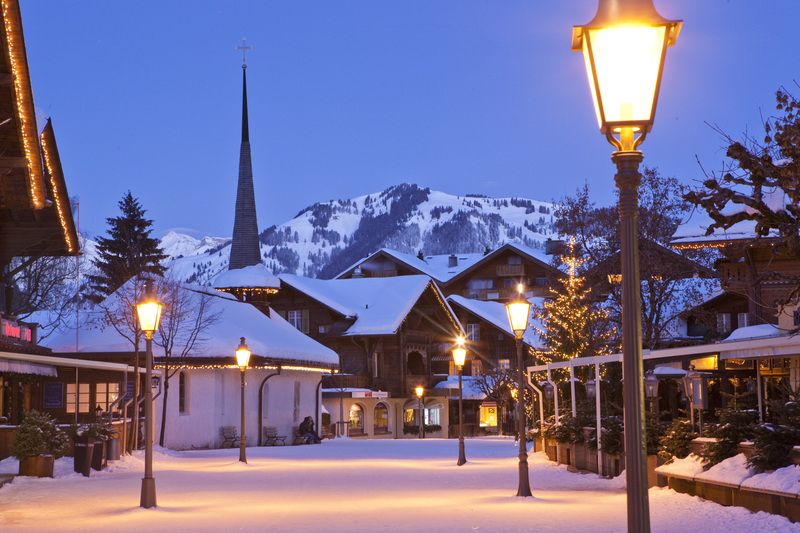 Resolutely well heeled, Gstaad is no après ski hootenanny but the refined, genteel sweetheart of the ski set. Tradition runs deep here – the Montreux Oberland Bernois trainline first ice-picked it’s way through the mountain passes in 1905 and almost ever since the elite have called it home (at least for winter). In fact, considering its roll call of alumni from world leaders, artists and designers to Hollywood’s great and good (Peter Sellers, Elizabeth Taylor, Bridget Bardot not your Kardashian clan) what may comes as a surprise is Gstaad’s warmth. Sure, it’s glittering, exclusive and wealthy but it’s not snooty and warm welcomes abound. While the skiing is, of course, a big pull for most visitors the town’s clutch of five-star hotels make this snowy enclave a magnet for foodies, wellness travellers and activity hunters. The spas are, as you come to expect with most things in Gstaad, first class. 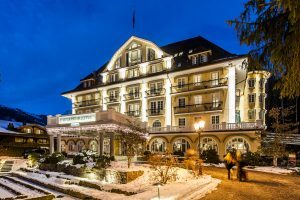 I’m staying at Le Grand Bellevue, a hotel that is classic Gstaad from the outside (grandiose entrance and picturesque snow-dusted turrets) yet on the inside the owners (who met and married in Gstaad and are passionate about the hotel, the region and all in it) create a world of colour and contemporary style. 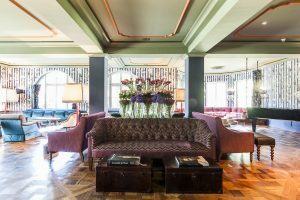 There are snugs, glass-fronted fires and chesterfields for cosy afternoons but also bird cages to sit in and swing with a cocktail in hand, bright flashes of wall paper, oh and a life-size plaid camel named Leonard at the entrance to its eponymous restaurant. The piste de resistance, though, is the state-of-the-art subterranean spa. 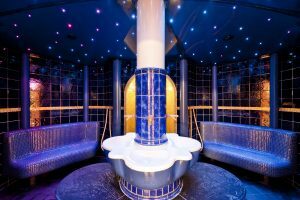 Le Grand Spa has a feast of 17 sauna and steam rooms for guests to choose from including the de rigueur infrared sauna, a mosaic-clad Himalayan salt inhalation chamber, a Laconium, Turkish steam bath and herbal sauna. You can easily spend a long, leisurely afternoon drifting between the rooms of the thermal oasis. There are 10 treatment rooms and a choice of exquisitely designed relaxation areas. Unusually for me, I opted for a run of the mill back, neck and shoulder massage, yet it was anything but ordinary. Without asking about any niggles and knots my therapist, Andi, instantly located points of tension by touch and had a great variety of dreamy techniques. 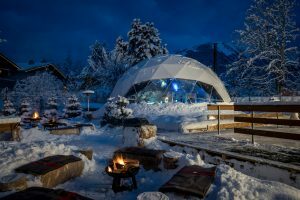 The spa’s facials are widely regarded as some of the best in town and there is also a botanical menu, draws on the traditions of the Saanenland region and features a sleep-inducing regional Alp Hay Bath. In the summer the log cabin frontage of the spa opens out on to a lawn, giving a really lovely country club vibe. And with the cold plunge, traditional sauna and heated spa pool outdoors, guests will feel a connection with the elements whatever the time of year. The main house has large rooms, some with balconies, some in the turrets of the building, which is a nice touch. Though our favourite rooms by far are in the new wing, which boast a traditional chalet feel, wraparound balconies and great views of the slopes – my bath had a perfect picture window overlooking the mountains and town. Snowy bliss. As I gently bubble away in the outdoor hot tub and delicate snowflakes begin to fall, I see the endless appeal of Gstaad. 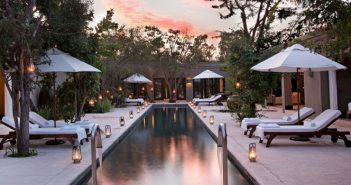 In winter, cloaked in its blanket of dazzling white, it’s easy to fall in love, but with the wide and varied spa offerings and incredible vistas I dare say it’ll be rather easy to fall for its charms any time of year. Gstaad is a relatively small resort but packs in 220 km of slopes and the only glacier ski area in the Bernese Oberland. 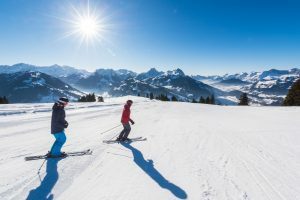 Families feel at home on the Rellerli or on the Wispile above Gstaad. The Tiger Run, the legendary steepest ski slope, is on the Wasserngrat. A trip to Glacier 3000 mountain station on the plateau of Les Diablerets is a must. On a clear day, you can see 24 summits over 4,000 metres, including Mont Blanc, the Matterhorn and the Bernese Alps from the top of Gstaad’s glacier. The views are epic from the moment the cable car sways into action and the Peak Walk – the world’s only suspension bridge that connects two mountain summits is fabulous for all ages. Ski, snow hike or take a snow bus to a lunch stop amid the pistes at Refuge L’Espace, a tiny hut on a spectacular precipice that will be one of the best meals of your trip. Hot tomme cheese of Rougemont with truffled oil & roasted potatoes with otherworldly vistas. 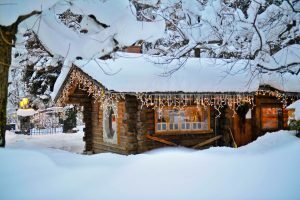 A traditional, rustic chalet nestled in the grounds of Le Grand Bellevue seating just 18 guests with a menu of hearty Swiss dishes. The ideal place to enjoy some classic fondue. A trip to Gstaad is not complete without visiting the Gstaad Palace. The turreted fairytale palace sits majestically overlooking the town and is a bastion of Gstaad legend. This is where Hollywood icons have stayed for decades and its famed nightclub has hosted politicians, royalty and celebrities. The dancefloor descends every evening over the spa’s indoor pool. The Alpina was Gstaad’s first new hotel for a century when it opened. The $336 million pound Alpina opened in 2012 to rave reviews, notably for its excellent Michelin star Restaurant Sommet and its Six Senses spa. Take a day to enjoy its outdoor heated pool and enjoy the place that is still the talk of the town. All rooms have balconies and as the hotel is elevated above the town the views are stunning. 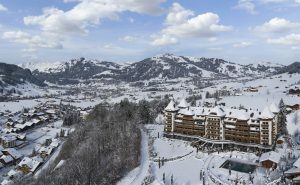 Head to Park Gstaad’s 1,000m2 spa and then enjoy lunch with a view of the peaks. Or better still, visit just before nightfall when the hotel is lit with hunreds of fairy lights and outdoor fire pits provide the perfect spot for a hot chocolate. The hotel even has its own ice rink and igloo bar. Getting there: Swiss Air flies direct to Geneva.